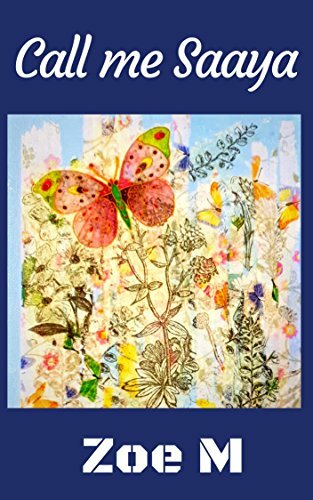 This book is for the romantic dreamy souls out there, looking to escape to their own magic land, away from the humdrum. Witten in a humorous manner, this enchanting sweet story is sure to leave a lasting smile on your face. But do keep a pack of tissue to wipe away your tears in one of those emotional lovely moments. The story reinforces love and trust in you and celebrates the love between parents and child, lovers, and family. The novel revolves around Nitya, a young bright girl from Kerala, India. She is a go-getter and is all set to do her masters in one of the best universities in the world in the USA. Her life revolves around her parents, relatives, friends, who try to make her world safe much to her reluctance. All her plans go haywire, when he enters into her life with a bang. He is a charmer, a perfect gentleman with a helping hand. She finds herself smitten and is unable to hold on to her agenda. For once, she just let it be and falls in love, only to realize that there is no undo button. 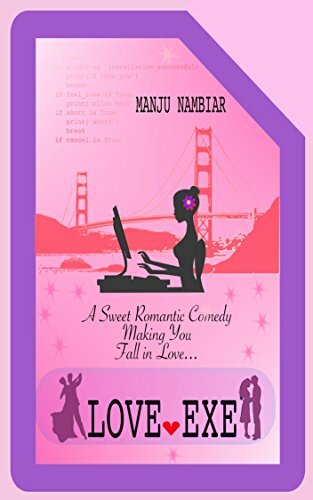 A beautiful love story follows taking the readers for a roller coaster ride through a series of twists and turns, emotions, suspense and laugh. This coming of age, beautiful tale of love, relationships and dreams is sure to prick your soul, bring a smile on to you, and tear up your eyes. Love exe. Is a simple yet beautifully woven plot. As they say beauty lies in simplicity. This book will win your heart with its simplicity all over again and again. Based on a old school thought. Where niyati gets a scholarship for her master’s and plans to move. Parents peer pressure makes her choose one of the things. Both of them share a lovely relationship and they help you connect back to the simple love without mentioning any love scenes. Parts where they are just enjoying the company of each other. The language is easy to understand and the author has done a brilliant job in creating emotions and taking you along with the story. It is a lengthy read . Love. Friendship. Family. All of the things that come in reality has been explained well. The cover could have been better designed. It’s a lovely book to fall back into love again. Call me Saaya by Zoe M.
Shamsher Singh Rathore has it all. A job he loves and a life he lives every moment. Until an untimely call from home embroils him with a woman called Saaya who proceeds to turn his orderly world upside down! The only interest Sayana Singh Rajput had in him was the prized Sheesh Haveli. She had never believed in love until destiny threw her this impossible challenge. What do you do when all that you believed in turns out to be a lie? Will Shamsher be able to save his world? Will Sayana believe in love or will she allow avarice ruin it all? What happens when desire meets destiny? Call me Saaya is an extravagant book with twists and a beautiful story. the cover is simple but not that relevant to the story. The characters have been well explained. The themes covered is love and revenge. It is a story which will make you feel like oh no this should not have happened. They totally belong with each other. What you will really like is the way the streets and the street foods have been described in the book which will make you go hungry at times. Samsher and sayana share a love hate relationship. Samsher is here in the city to get back revenge and I will not leak the plot for that you will have to read. The vocabulary is really good. Easy to understand along with many new words to learn too. Really love it how the author went a little further to create a new atmosphere and story altogether rather than the usual ones. The book will make you learn quite a few things. It is bit of a lengthy read but is a page turner. Hinglish is also use in the book. Overall I really liked reading the book and would totally recommend you this book! The author has done an amazing job trying to explain and create imagery in your head. FROM EMPTINESS TO HAPPINESS, Anaesthetising Negative Emotions is the story of a fiercely independent, young Anaesthesiologist Dr Riya. Riya is an emotional person; every emotion she experiences is deep and intense. After a tragic incident she relocates to Mangalore to start afresh. Riya meets Dr Samith a general surgeon in the operating room and develops an instant liking for him. She discovers that they have a common friend, someone who played an important role in her life before relocating to Mangalore, someone she never wanted to remember. Samith is a simple guy from a conservative family. Even though Samith didn’t approve of Riya’s past, he loved having her around. Riya had mental health issues to deal with, she had to gain control over her intense emotions and get her life back on track. She is aware that history could repeat and there could be fatal ramifications if things didn’t end well with Samith. She decides to give it a chance as her gut feeling told her that Samith loved her. Will they end up together? Will history repeat? Let us find out. Dr Sandhya Mohan is an Anaesthesiologist from Mangalore. Her father Late M C Mohanan was an advocate and mother Rema Mohan a homemaker. After MBBS from K S Hegde Medical Academy, Mangalore, she worked for two years as a casualty Medical Officer in Kerala. She moved to Surat to pursue MD in Anaesthesiology. She is a Gold Medallist in Anaesthesiology from Veer Narmad South Gujarat University, Surat. She is working as Assistant Professor in a Medical College in Kerala. Her hobbies include cooking, reading and dance. She is also a trained Bharatanatyam dancer. 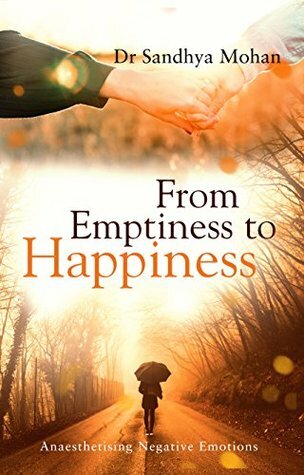 “FROM EMPTINESS TO HAPPINESS, ANAESTHETISING NEGATIVE EMOTIONS” is her debut novel, it is an attempt to create awareness about mental health issues. The delivery was prompt and the package was neat. Starting off with the cover it shows a one ride that life is and the hand holding is showing up a romantic story brewing up. The blurb gives you the gist about the book. Dr. Riya is the protagonist of the story and the story revolves around her life and love life. Most of the talks here are about hospital. The story was a bit themed about mental health but mostly about needing someone in this walk called as life. The story follows a simple format and plot. No twists in the plot are there it is a simple story. The language is easy but medical terms might be confusing for a few people to read. The first half could have been compiled much more short. It felt like an on and off love life and the busy schedule that is being followed by. The little chats and 21st century references are relatable. The title could have been different. The ending was predictable. The author has written a simple and sweet story good for a one time read. In conversation with Amit Joshi Author of freelance training. Amit Joshi is a successful trainer with 13+ years of experience in Language and Soft Skills Training, Profit Centre Operations, and Accounts Management, who has coached clients from various industries through diverse trainings. 1) Tell us a little about yourself and how your journey has been through as a freelance trainer? I am a Corporate trainer for Behavioral and Leadership skills. I have trained over 3000 participants from more than 40 leading MNCs and the author of the book – Freelance training- How to crack the Freelance Training business in India. I am also a trained trainer from The British council and Instructional design from TISS. I have recently started my own company for Corporate training. My journey as a Freelance trainer has been very exciting, learning and growing every day. The initial days were quite difficult, as I tried to acquire new clients and get training assignments. However after the first year, have been growing consistently thus making the journey very fulfilling and rewarding. 2) Why did you choose this topic? When I first made a switch from a full time job to freelance training, back in 2013, there was no visibility in the market on how one can navigate in the arena of Freelance training. I had to make my way through trial and error. Later on, when I got reasonably established as a Trainer, I thought of sharing my learning with aspiring trainers and that’s when I thought of writing my book. 3) Does this book have any personal incidents? Yes, the book has several personal incidents and experiences. I added them to give the readers a vivid perspective of the Freelance training profession. 4) As this book is about freelancing. How many freelancing jobs did you do?some incident ( could be funny/ motivational)that really left an impact over you? As mentioned earlier, as a Freelance trainer, I have trained more than 3000 participants from over 40 leading companies. One incident which is quite memorable happened during my initial days as a Freelancer. I got called for an interview for a training assignment as a voice coach for a BPO. It was actually a teach-back, i.e. a demo training session. That was my first interview as a trainer and I was fairly confident about my knowledge and training ability, However when the demo started, the panel started asking questions about English grammar and some technical details about Voice and accent training. I was totally stumped by some of the questions and my hands were literally trembling. I was rejected as expected however, once I came home, I did extensive research on the internet and watched several videos on Youtube related to the topic and later on I did quite well in the other interviews on that subject. That was a great learning experience for me and will remember it for a long time to come. 5) Who are your role models? 6) Your favourite authors? What do you really love about them? there are a few favourite authors mostly from the Non-fiction books domain. I am thoroughly impressed by Malcolm Gladwell, Ram Charan, Robert Kiyosaki and Robin Sharma. All of their writings are based on in depth research, succinct writing with a lot of valuable tips to implement the learnings from their writing. I strongly recommend reading their books to whoever is interested in Non-fiction self help, Management and Leadership related books. 7) Can you give a little brief about the book and what it means to you and giving out a part of what you do out to so many people? Before I give information about my book, I would like to set some context. There is an immense scope for Training in India because of the skill gap between the Industry requirements and the skills provided by our educational institutes. There is also an immense need for training the existing workforce to meet the challenges faced by modern day organisations. A lot of companies are now realising this and have increased their focus on Learning and development. The training industry is quite nascent in the country and needs to evolve at a rapid pace to meet this challenge. Companies either have a dedicated training team to up-skill their workforce or tie up with Training partners to achieve this. Thus there is a growing need for trainers specialising in a wide array of subject areas and skills to keep up with the requirements. This need is being addressed either by full time training professionals or through Contract/Freelance Trainers. 8) As most of the millennials like us are confused with what to do in life what do you think that Freelancing will turn out to be the major developing field in the future times? Will this book guide us with the whole process? Full time corporate jobs are becoming extremely dynamic and stressful day by day. No job or industry promises a long term safe secure career. The key is to constantly learn, unlearn and grow. Also, the current generation is very ambitious and not afraid to explore novel paths. Owing to these reasons, Freelancing will surely be a viable option and will grow in several fields. My book specifically deals with Freelance training profession however it can also provide some general guidance for freelancing overall. 9)Since how long were you articulating this book? 10) If it could be rewritten which author would you like it to rewrite? I would like it to be written by some popular author like Chetan Bhagat so that it can reach out to a vast audience. 11) How did you start writing? I started writing almost 8 years ago when I used to occasionally write articles, however started writing seriously just a couple of years ago when I wrote my book. 12) What does writing mean to you? Writing is a means for expressing and gaining clarity for my own ideas. I also view it as a way to help other people. Personally, it can help to establish a brand for myself and establish my credentials. 13) Did any special research/ incident happen in putting up this book? 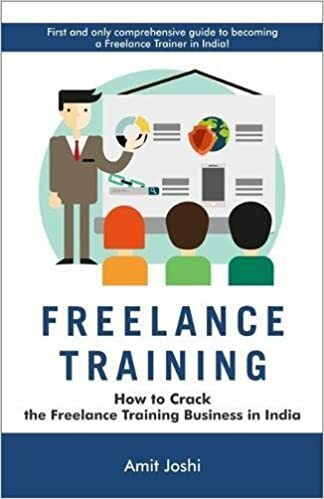 The book is based mostly on my first- hand experience in the Freelance training world and I believe that would add a lot of value for the readers who are considering this career option. 14) Any future publications/ previous publications? In the future I am planning to write books on alternative careers for today’s youth and about learning styles and preferences of children. 16) what is your usual process in writing? Do you write in a stretch or throughout in between chores? Given my schedule, it is difficult to set a fixed time regularly for writing. I find time to write, in chunks i.e. some days I get more time whereas there are days when I do not get time at all. However I make sure that my mind is always working on the concept/subject I want to write on. I then break it into smaller tasks, starting with the broad outline, sub topics in the beginning. Once the flow and the outline are clear, it becomes easy to elaborate on them when I get some more time. This is how I managed to write my book. 17)How do you get rid of writer’s block? Haven’t really experienced a block so don’t know how to overcome it. The only challenge I face is to manage time. Based on a tip from another author, one thing I can suggest for Non-fiction writers is to get ideas about questions people might have related to the subject from Quora. Once you know what questions people are asking, you can guide your thoughts towards answering them. 18) What troubles did you face during publishing the book. What changes do you want out in the whole process? Since I had no knowledge about the publishing world earlier, I had to do a lot of searching on the internet to find out the publishers and know who would be interested in publishing my work. Once identified, the other challenge was to pitch for the book by sending the proposal in their formats and convincing them about the potential of my book. 19) Some writing tips for our writers/bloggers/ freelancers? Read like there is no tomorrow and be hungry to learn new things. If you follow these tips, writing will come automatically. 20) Something for our readers? Read like there is no tomorrow. Lousfa Organic Pure Shea Butter for Body and Face, 100g pack. link to know more and buy the product. Pure unrefined shea butter raw – 100 % natural and organic pure shea butter – made with hand selected finest nuts of the shea tree in ghana. We work hard to provide the highest quality, softest, easy-to-use, organic ghanaian shea butter your skin will ever feel. Our convenient butter blocks keep your fingers out of a jar and make it easy to slice off just what you need to whip up your favorite skin care recipes. 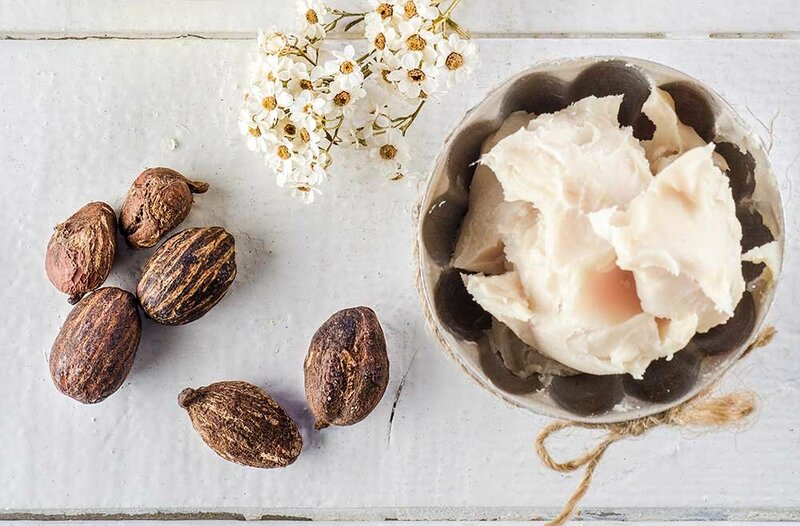 And guess what: Our shea butter is 100 % pure and unrefined. Very popular as a daily moisturizer. Excellent for stretch marks from pregnancy or other reasons. Great to use as a tummy butter for expecting mothers. How it works: deep daily moisturizer for skin and hair – contains vitamin a, vitamin e and vitamin f – does not clog pores – highly moisturizing and long lasting – beneficial for hair and skin health and beauty the brand: cleopatra’s choice has been harvesting, importing and producing the finest raw shea butter for over 6 years. Unlike the recent newcomers to the market we are experts in what makes fine shea butter. Cleopatra’s choice shea butter is used by top skin care dyi experts for dyi soap, dyi lotions, body butter and more. No chemicals. No additives. Just pure, silky, skin-nourishing shea butter -perfect for your toughest skin issues like eczema, acne, and dry, cracked skin. So go ahead, indulge and renew yourthirsty skin with our velvety butter and watch the transformation to a glowing skin. Having ordered for the second time with this company the delivery came in intact and was not tampered or destroyed. It was neatly packed and came well in time with no further delays. Having read about shea butter so much in the recent times due to bloggers, health care professionals and makeup artists. I finally gave in a try to this product which is 100% organic. Was very excited to use this product. The colour of the butter is whitish and has multipurpose use in health such as hair,skin maintenance. It has certain amount of spf as well. It helps in calming the irritation and makes the skin smooth. The butter does not have any fragnance in particular but some essential oil can be put up and be made used in other products too. Something about the smell of the product could have been taken care for. The butter is not that oily or heavy on the skin which was a relief. It can be used daily or on weekends as spa for personal days. They have various flavours available such as cocoa,mango and various other such items. Easy to carry pack with so many uses definitely needed for dry skin or to keep the skin hydrated and mosturized all time. overall I am liking the product so far and will be using it. To can contact me for more product reviews over my email. Indraneel ‘Neel’ Ray is an ex-advertising man who has recently bid farewell to his successful career to embark on a writing journey. One morning he is seen on the streets of New Delhi, disheveled, nursing a huge hangover, and with no memory of what transpired the night before. Soon he is wanted by police for allegedly killing the son of a prominent politician. He himself doesn’t remember killing anyone and can’t think of any reason why he would have. His friends have deserted him and the only person he can turn to for help is his ex-girlfriend. All Neel has going for him is his dogged instinct for self-preservation and a devilish streak of good luck that aids him in rather unexpected ways. 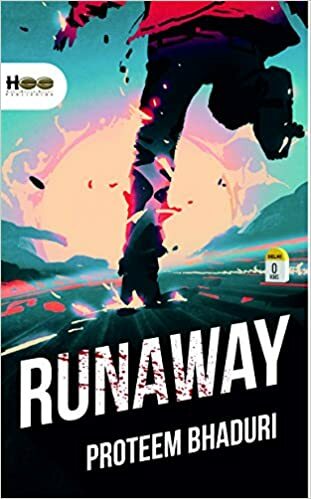 Runaway is a fast-paced tale of Neel’s frantic attempts to stay ahead of his pursuers, to uncover what really happened on that fateful night, to establish his innocence, and to stay alive while doing all of that. This book is a debut by the author but the way it has been written and the twists have been given really takes the reader by toll. Starting off with the cover it suits well with the story that follows and is creative with the title. The concept of the story is really interesting giving it a new twist. Each line has been written meticulously. The language is easy to learn and you will learn new words as well along the way. The protagonist does not remember anything and he keeps moving from here to there while in the parallel police is finding for him. All of it is related. Sometimes a few things seemed a little stretched but it is a good read giving you more room for imagination. The pace is medium of the story. It is a good thriller book with a fresh idea and plot put up. The author has done a good job with the research and reaching to the depths of the characters. All the elements needed have been kept well by the author.